The technical process to convert sunlight into algae and then into fuels has been tested by industry and approved by regulators. The current challenge is to produce commodities such as fuels and feed at a competitive cost. There are two principal ways of cultivating algae today – open ponds and closed photobioreactors – and both face significant challenges to produce algae biomass at an appropriate cost, so that this can then be converted into commodity products. 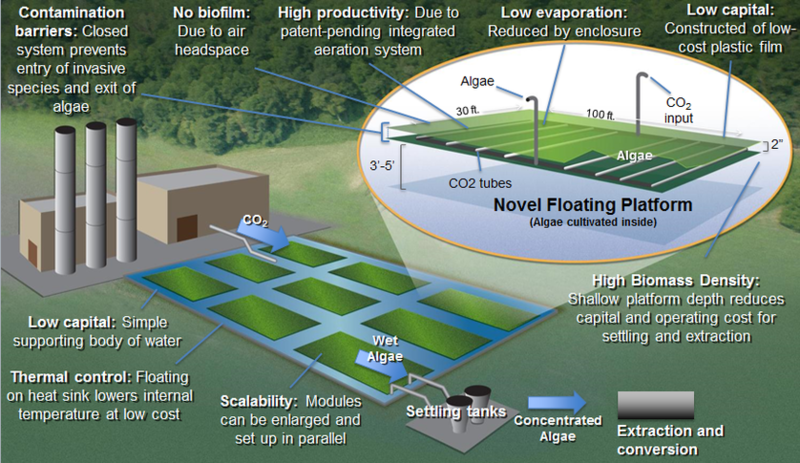 Culture BioSystems has developed a hybrid technology platforms that takes the best of both traditional cultivation methods – a low-cost, closed system that can float on an open pond (FloatAlgae) or be deployed on the ground (LandAlgae). This improved engineering design allows for the production of cost-competitive products using natural algae strains. The Culture Fuels cultivation system works with any algae strain and final product market. Requires lower capital investment to construct algae facility. The figures below present the system embedded in an integrated algae facility with a source of carbon dioxide and generic equipment for settling the harvested algae and then extracting the oil. The system can be deployed on water or on land.